In 1539, Cardinal Jacopo Sadoleto, Bishop of Carpentras, addressed a letter to the magistrates and citizens of Geneva, asking them to return to the Roman Catholic faith. John Calvin replied to Sadoleto, defending the adoption of the Protestant reforms. 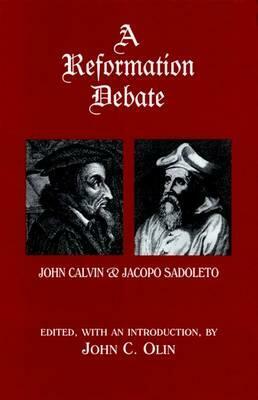 Sadoleto's letter and Calvin's reply constitute one of the most interesting exchanges of Roman Catholic/Protestant views during the Reformationand an excellent introduction to the great religious controversy of the sixteenth century. These statements are not in vacuo of a Roman Catholic and Protestant position. They were drafted in the midst of the religious conflict that was then dividing Europe. And they reflect too the temperaments and personal histories of the men who wrote them. Sadoleto's letter has an irenic approach, an emphasis on the unity and peace of the Church, highly characteristic of the Christian Humanism he represented. Calvin's reply is in part a personal defense, an apologia pro vita sua, that records his own religious experience. And its taut, comprehensive argument is characteristic of the disciplined and logical mind of the author of The Institutes of the Christian Religion.